The TGA rates Member Club and Non-Member Club courses in accordance with the United States Golf Association (USGA) Course and Slope Rating System. The USGA requires that all new golf courses be rated after five years. All courses must be re-rated every 10 years. 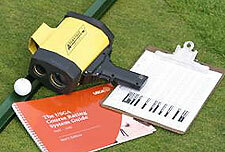 Utilizing regional teams of raters located throughout Texas, the TGA rates approximately 75 to 100 courses annually. Precise course and slope ratings are provided for each set of tees so that all golfers can enjoy the benefits of an accurate and equitable handicap system.